Whenever I’m in the market for a new headset, I always keep comfortability in mind. I always ask myself if it’s going to be comfortable to wear especially since sometimes I wear glasses and there are some headsets out there that aren’t really compatible with a person that wears glasses. 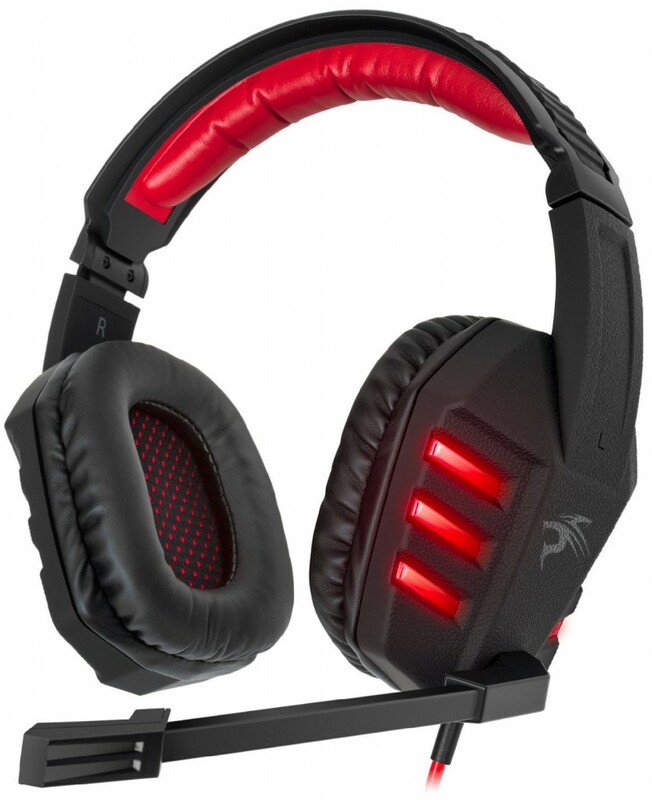 With this specific headset by Sentey, that isn’t the case. Whether you wear glasses or not, these are going to be extremely comfortable for you to wear. Because it has an ergonomic design and the cushion pads for the ears were created to fit anyone and everyone. This is extremely important since, you know, not everyone’s head is the same size. 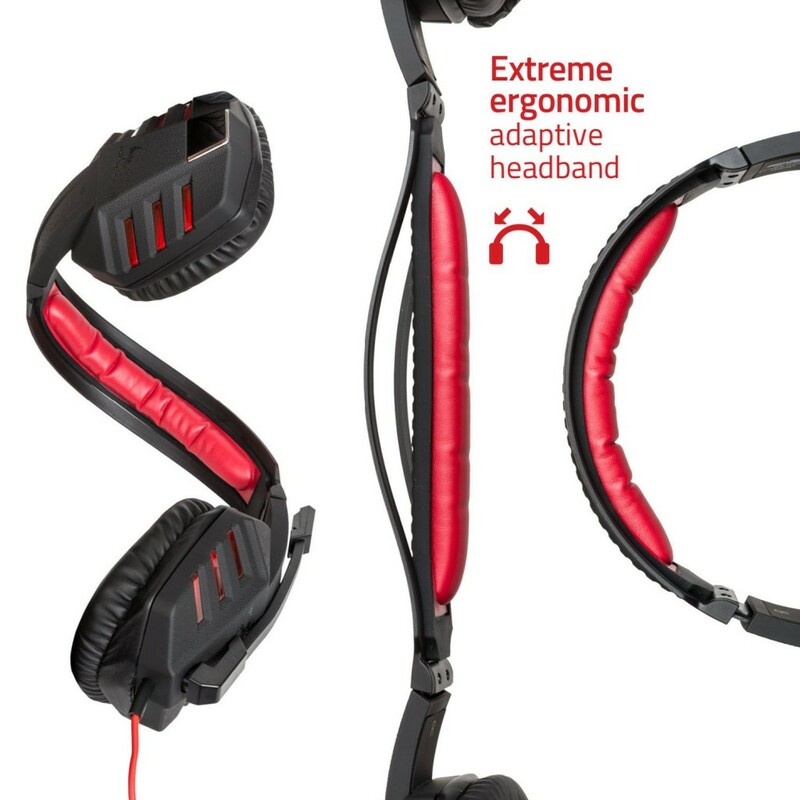 What I think is one of the coolest features of this is that the ergonomic design includes having an adaptive headband, meaning you can twist and turn it without it breaking or anything. Refer to the picture on the right to get an understanding of what I’m saying here, this is an awesome feature. Some headbands on other headsets out there are made out of a plastic material which can actually shatter if you are careless about what you’re doing with it. That’s just not the case with Sentey’s headset. The headband isn’t made out of any sort of plastic, it’s made out of a high quality material that you can twist around and move however you see fit. This is how it’ll fit anyone’s head, it basically forms itself to whatever size head that a person might have. Again, a feature like this is mainly seen in some of the more expensive ones out there, ones that are around the $60 price point so that alone makes this headset 100% worth every penny. Another great feature of this is that you’re able to control the volume level and whether or not the mic is muted via a control down the wire of the headset. This is another feature that you more so see on some of the higher priced headsets and it’s a feature that is well sought after when people are in the market to make a purchase of one. I can definitely see why, having simplicity with the control of your headset is an important key factor. The headset that I currently use has all of the control on the headset itself and honestly, I kind of wish it had a control much like what this one has instead. Reason being is because I not only like being able to have an easier access to the controls but I like the look of this as well, especially with the red LEDs on it. This shows that Sentey isn’t only about providing good features on their products, they’re also very keen on the overall design as well. In my opinion, that is very important with any kind of product that any company makes. It has to look epic in order to get the sales through the roof! 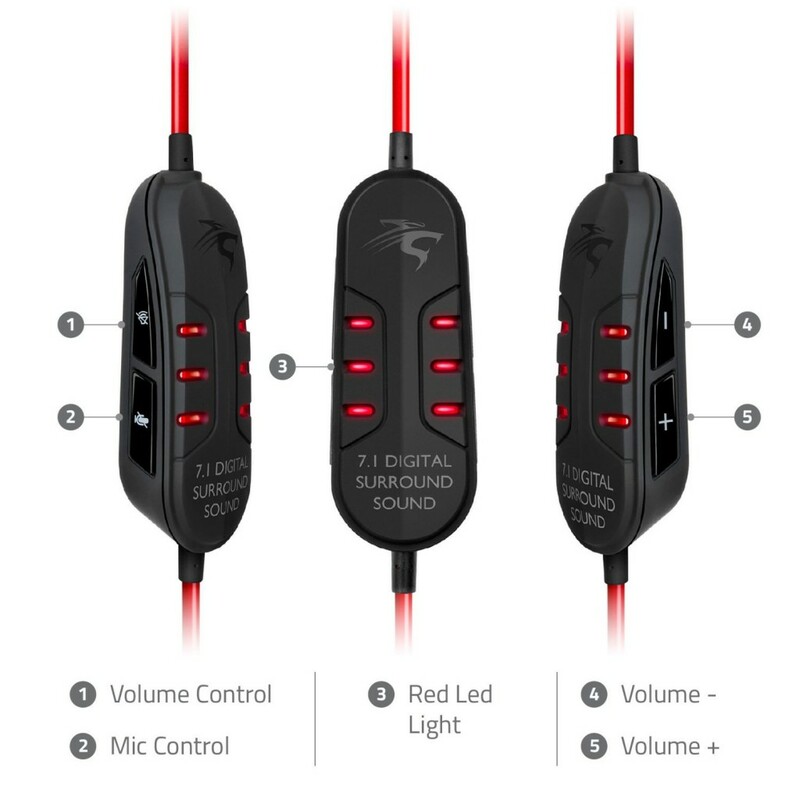 The control for this headset has an awesome look, it’s extremely easy to use and it acts as yet another great feature for this headset. With all of the features included with this, I honestly think that it should be priced higher. Especially since these also include 7.1 digital surround sound. When you take a look at how games have evolved you’ll notice that the graphics have increased dramatically… but it’s not just the graphics that have evolved. The same is also true with all of the sounds that a game has. Every year, sound gets better and better and the levels of immersion heavily increase when you’ve got dungeon sounds, epic gunfire or the realistic sound of swords clashing together. Sound is extremely important in any game and that sound is best experience by having some sort of digital surround sound technology included. Well, guess what? 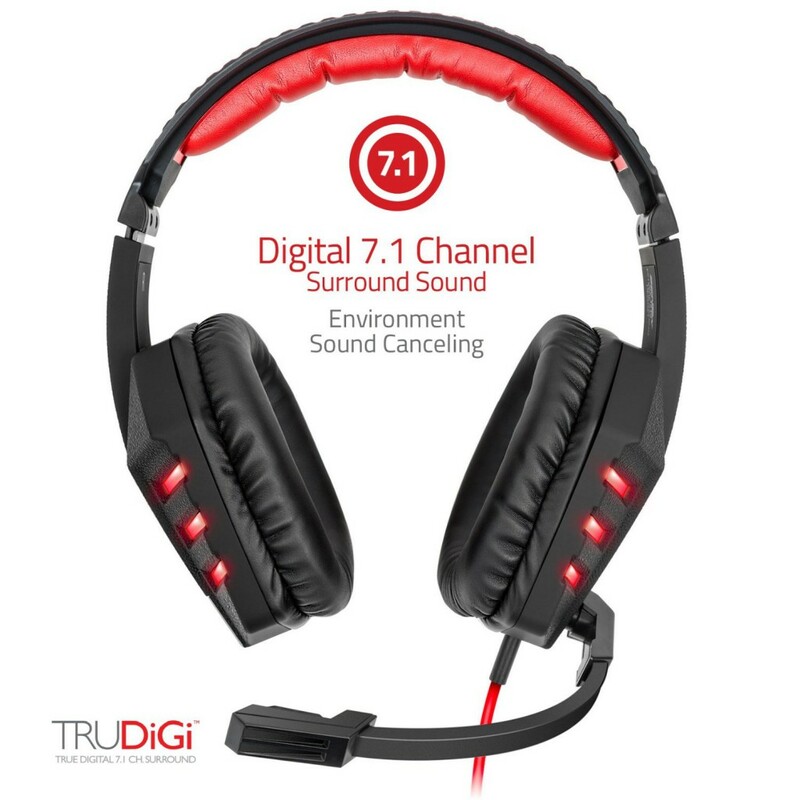 Sentey included 7.1 digital surround sound with this headset as well and it works perfect. Not only that but the ear muffs are noise canceling as well, making being immersed into your gaming experience extremely easy. I have some surround sound technology on my headset and it is also toggle-able. There is a finite difference between using surround sound and not, I never turn off the surround sound. The immersive atmosphere that comes with is amazing! There is a realistic echo and you’re able to actually pinpoint where footsteps and other certain sounds are coming from in whatever game world you’re in, it is truly spectacular. Surround sound of any kind is basically essential to get the full immersion that is included in today’s games. There are plenty of sounds that you’d otherwise not hear by not having surround sound, you’d be surprised at how much of a difference that it makes! All in all, Sentey’s PC gaming headset was definitely in need of a review since it packs a powerful punch in the headset industry. It is packed full of features that you’d normally see on the more expensive sets, might as well get everything that they include at a lower price point! So, what do you like about Sentey’s PC headset? Is this the type of headset that you look for when you’re in the market for one? Tagged headset, pc gaming headset, sentey, sentey headset. Bookmark the permalink. It is more expensive, but I’m wondering if it is really worth the buck? Is it actually a much higher quality, or would a cheaper one be better? I don’t really know what to look for in a headset, and I’m not sure if it is really as great as they say. Thanks. If you have the budget for it then I think that the Logitech G230 would be the better headset to go with. Logitech definitely focuses on quality. it is fairly the same price,and the one that i put above in my opinion seems better- what about you? If it isn’t what headset do you recommend(my price limit for headset is 30$)? The headset that you’re referring to is this one, right? Glad to hear it! Thank you for everything! For sure I would 😉 you’re welcome for the help!! Hi Colton,I Bought This Gaming Headset a few days ago! i just got it yesterday and it is so cool! the mic quality is great,the LED lights,etc.! Right on man, it’s a pretty awesome headset! Glad that you’re digging it!